Greetings! My name is Vinnie. It is a pleasure to meet you. I was donated to Fieldstone Farm in March of 2015 by Sandra Crabtree of Indiana; that is where I used to live. After 10 years together, we moved in June of 2014 to Ohio. It was so much fun; I was her first horse. I was ridden English and Western. Most recently, she had been showing me in local and USEF “A” shows; my show name is DaVinci. One of my proudest moments and the most fun we had together was my bridleless jumping demo we did. Boy, we made quite the team. Sandra moved up to the bigger jumps and I was getting a little up in age so that is why she thought that Fieldstone Farm would be a great place for me. She knows how steady, easy going and talented I am and she really loves me, so she wants me to be happy. Thanks mom, I am very happy here! There are lots of activities to keep me busy and I am anxious to teach all my riders and give them the confidence I gave you. Believe it or not, I was born in 1999 and I look and feel like a youngster. I have so many years ahead of me. 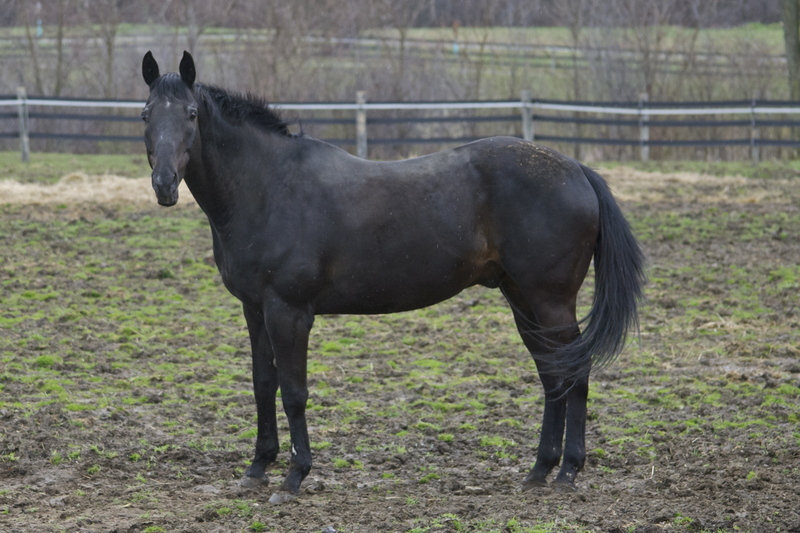 I am quite the handsome fellow; I am a black, Quarter, Thoroughbred, Morgan cross that is approximately 16.1 hands tall. I love to be groomed. My mom taught me good ground manners, so I am quite the gentleman to work with. I enjoy the activities in the ring, but my favorite is teaching riders to be more independent. I know I can give them the confidence they need. I am very solid and level headed. There isn’t much that surprises me. I am such a laid-back guy but I really do like to work and have a job. I heard several of the staff here say how “perfect” I am to ride. I aim to please! Well, enough about myself. I am sure I will meet you all very soon. I know I’m a favorite!